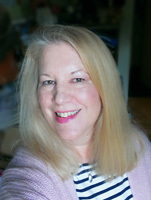 Posted May 23, 2015 by finnfemme & filed under Daily Life, Frugal Living, Health. Since I love making my own detergent and have had great success with my original homemade powdered Zote recipe, I’ve been goofing around with making a liquid detergent that’s a bit more gentle in its approach. One that is good for washing delicates, or for laundry that really isn’t all that dirty. By this time you should all know what a Zote soap freak I am. Just because it’s the most awesome laundry soap on the planet! Not only do they make the giant bars, which I grate for my powdered Zote recipe, but they also make Zote Laundry Flakes that come in a box. The flakes are wide, flat and easily dissolved, and have that fantastic Zote scent. 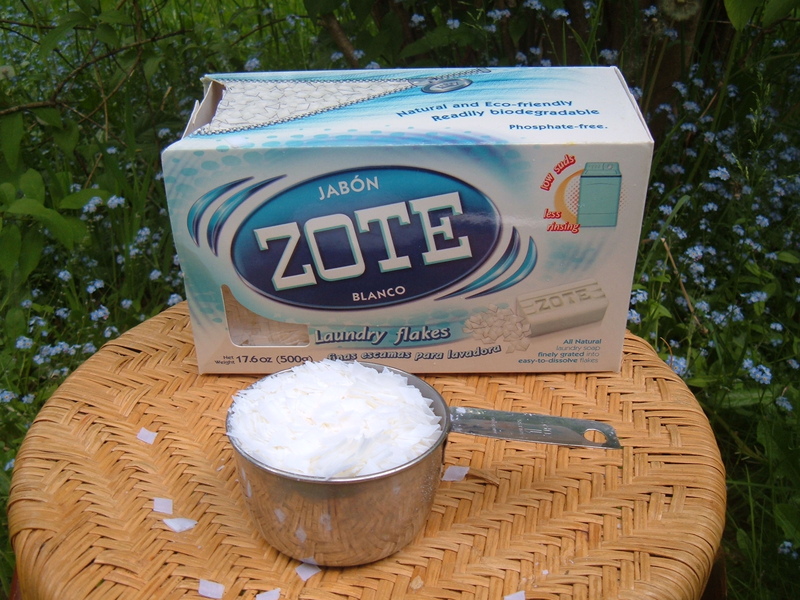 Zote Flakes are natural, eco-friendly, readily biodegradable, and phosphate-free. Anyway, because I’m generally lazy and don’t like a lot of complicated steps, I’ve concocted a liquid laundry version that is incredibly simple and requires only two ingredients: Eight (8) cups water and One (1) cup Zote Laundry Flakes. Please note that I am using the pre-shredded flakes for this recipe, I haven’t tried this using Zote soap that I’ve grated myself, preferring to use that in my powdered version. 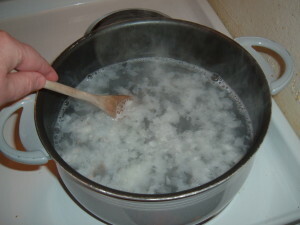 Step 1 – Heat 8 cups water until just below boiling, and remove from heat. 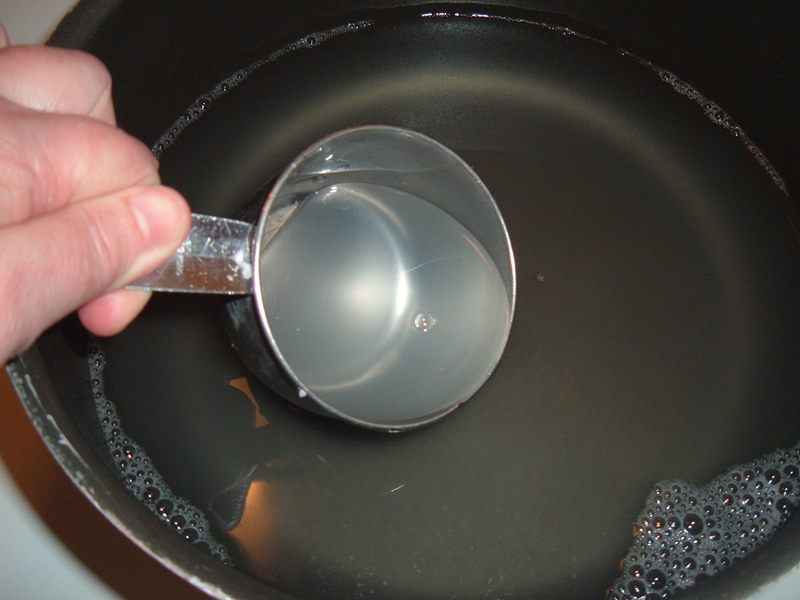 Step 2 – Add one cup of Zote Laundry Flakes, and stir gently until dissolved. Let cool for 30 minutes or so. 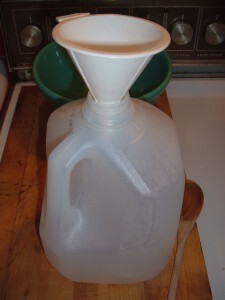 Step 3 – Pour into a large container – a funnel really helps with this part- I used an old gallon milk container. Let it set for several hours, or overnight. 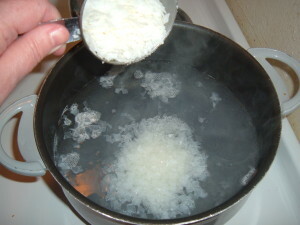 Step 4 – It will form into a thick gel. 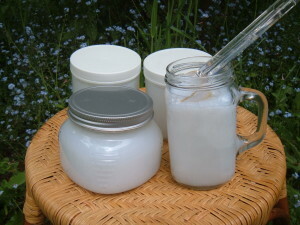 You can then portion it out into smaller glass containers like I did (this recipe fills four 16 ounce jars). I’d use about 1 Tablespoon for hand-washing, or small loads, 2 Tablespoons (1/8th cup) for a larger load. The liquid is rather gloppy and viscous, but it just adds to the fun. 😀 What I’ve found is that it cleans very gently and the laundry is a lot softer. Which to me, as a clothesline user, is important. Let me know what you think in the comments!